Want it, need it, must have it? You can get it here. amazing consumer electronics, which we are happy to offer to our customers. These atomizers can also be used on other 510 batteries and mods. Compare to $13 - $16. You save anywhere from $4 to $7 per piece. Even if you buy it for resale you make profit and still are competitive. Clearomizers make great source of parts if you're building your own mod tank or custom product. Clearomizer 808D-1 thread with 2.8 - 3.0 ohm atomizer for 3.7 volt KR808D-1 e-cig. 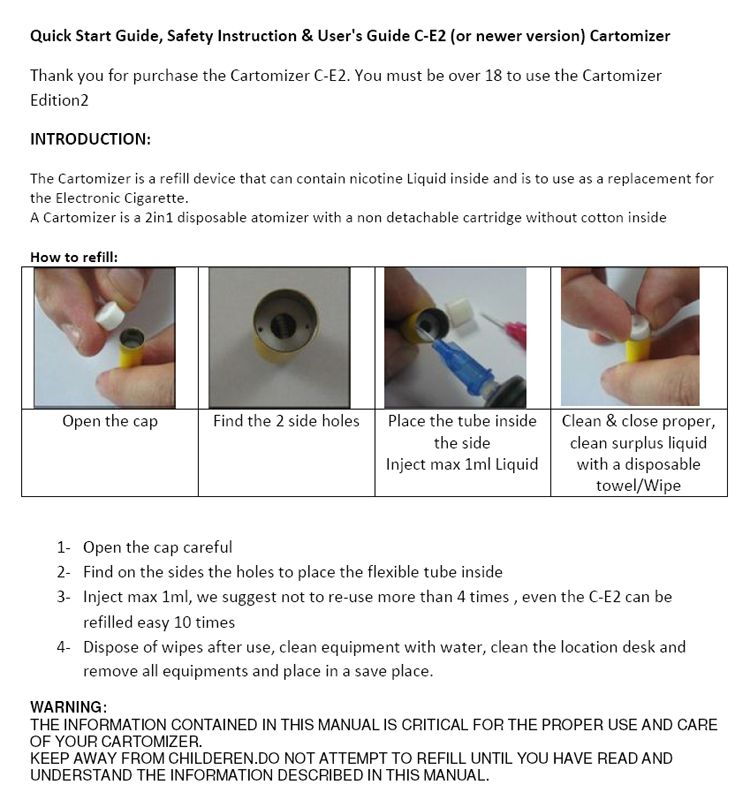 Extra large 1.8ml cartomizer lasts twice as long between refills and is priced lower than competitive products. Comes in box of 5 in orange or black 3ohm 510 thread. The orange color looks good with white battery, black goes nicely with black battery. Just add your own e-juice. 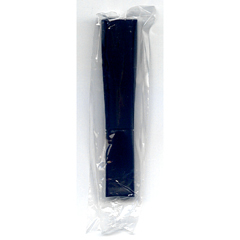 Soft rubber cap makes refill very easy and the vapor is consistent due to the slim long design. 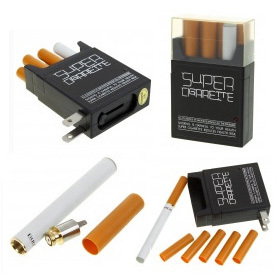 This kit contains everything to try electronic cigarette. The plastic case is about the size of pack of cigarettes. It has built-in 120VAC charger. The battery is 510 type and can be used with any 510 atomizer, cartomizer or clearomizer. The kit comes with one atomizer (the gold color part) and 5 cartridges prefilled with regular flavor e-juice. Just charge the battery for 3 hours, remove the orange (dummy cartridge) protective plastic and insert one of the 5 prefilled cartridges. The battery is little hard on draw, so take a long hard puff. Check the red LED on the battery tip. Make sure it lights up as you draw. Let's face it. Smoking is just a bad hobbit. If nicotine was the only factor, you put on nicotine patch or buy Nicorette gum and you're smoke-free. Its not that easy. That's where electronic cigarette or e-cigarette comes in. You can continue to smoke, but you don't inhale burning chemicals - only a vapor. It is called "vaping". Electronic cigarettes don't burn and don't produce second-hand smoke. They vaporize special flavored liquid called e-liquid or e-juice. E-cigarettes are not exact replacement, nor they taste exactly like your cigarette brand, but they come close to satisfy our smoking craving. Actually, most e-cigarette users switch from tobacco flavored e-juice to some sweet flavor, coffee flavor, or fruit flavor. It just tastes better than tobacco. I know, smokers don't believe this could ever happen to them. It can. You may not like e-cigarette in the beginning. It won't be the same as smoking, but give it a chance. Maybe involuntary chance when you can't smoke - like in the office, or in a bar. Try different flavors. There are hundreds of them available, and you can choose nicotine strength from no-nicotine to as high as you can handle without poisoning yourself. Full strength cigarette equals to 16-24mg, light cigarette equals to about 6-12mg, but e-juice is available up to over 30mg or more. Electronic cigarettes are made of 2 or 3 parts. One part is the battery. It is either automatic - turns on as you inhale, or manual where you push button when you inhale. The other part is where the e-juice is stored. That can be one piece called cartomizer, or two-part design with atomizer and the juice cartridge. Most users prefer cartomizer. They also cost less. Since the atomizers, cartomizers and cartridges are disposable, these are the "consumable" items you will buy over and over. You refill them few times, but they don't last forever. That's something to consider when choosing brand. Most popular are brands with 510 thread, with KR808D-1 (also called 808) close second. There are many others, but these two are most common and easy to get. So, give it a try. Quit. Stop smoking. Your body will thank you. Happy vaping. Liability and warranties limited to the value of equipment ONLY. your computer, or your computer rejects cookies, you won't be able to place items into the shopping cart. We do not collect any information and we do not spam our customers. We appreciate your business.